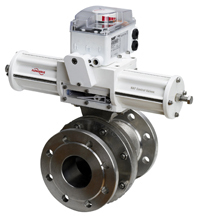 The NAF Trunnball DL is a full-bore trunnion-mounted ball valve, developed by Flowserve engineers with more than 80 years of experience manufacturing ball valves. The ball is supported by two large, low friction trunnion bearings for consistent low torque, even at high differential pressures. Due to its bidirectional tightness, low friction and high controllability, it is an excellent choice for isolation, on/off and modulating control applications. NAF Trunnball DL is supplied in stainless steel or carbon steel as a standard, but is also available in other materials, such as Duplex, titanium, and others. The design characteristics of NAF Trunnball DL are particularly suited to the most challenging operating conditions in the process industry, where difficult media and demanding pressure conditions make severe demands on the design, materials and performance of the valve.